Whopper's Bunker: Star Wars TV writers wanted! It appears God himself will not be actually writing the Star Wars TV show. This is not necessarilly a bad thing as he should devote more time to promoting his religion and leaving something as simple as writing to common writers. Apparently the folks from Lucasfilm were in Santa Monica looking for a few good writers for their upcoming live action TV show and met with writers from Lost, Battlestar Galactica and Heroes. As far as we know at the moment, the upcoming TV show will have a commitment of 100 episodes which would guarantee syndication, be bankrolled 100% by God and all episodes would be shot in Australia or perhaps Vancouver, if the price is right. Producer Rick McCallum has said that each episode would be given a budget of around 2 and 4 million dollars and would be catered to the teen/adult fans compared to the Star Wars films that were always catered to the teen and young children. Expect the Star Wars TV show in Late 2009 at the earliest however. Star Wars steals from Battlestar Galactica? The circle is now complete; when I left you, I was but the learner, now I am the master. "I'm for democracy...For the republic!" 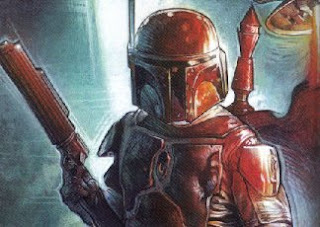 I'd pay good money to see Fett hunting down the ragged remains of the Jedi Scum, finally we may learn the eyptmology of the phrase "No, Distintegrations!